Caption reads "Who got tipsy @ NYE and PEED on the carpet?!?!" Disclaimer: No alcohol was actually consumed by any corgis (only humans). We love our Pembroke Welsh Corgi's and we think they are the best dogs in the world. 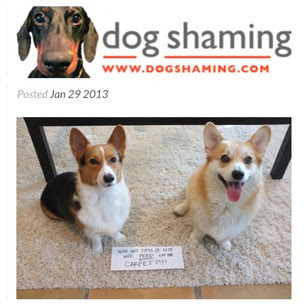 Dos Corgi's is a place where you can read about the latest antics of Tyler & Scooter.